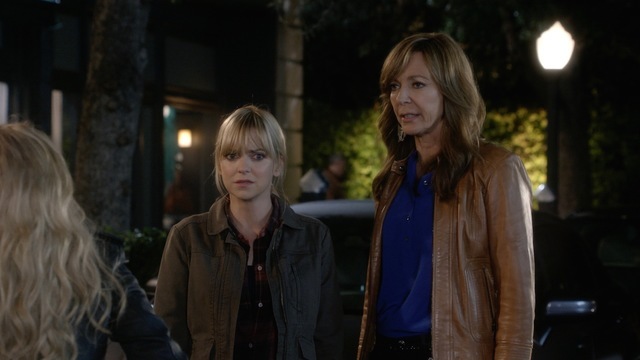 In this week's episode of Mom, whose star Allison Janney just won an Oscar, Kristin Chenoweth guest stars as Jill's life coach, who ends up having conflict with Bonnie. S5E14 "Charlotte Bronte and a Backhoe"
Jill is struggling with her eating issues, so her life coach comes to visit. Bonnie immediately doesn't like her because she takes her parking spot, and Marjorie ends up disliking her because she contradicts her message. It's really funny as the life coach tries to help Wendy, and when Christy sees Wendy actually being assertive, she decides to give an energy cleanse a try. The energy cleanse is very weird, but fairly entertaining because of that, and I really enjoyed Christy's line about a clump of bad energy being her childhood. When Bonnie finds out that Christy paid five hundred dollars for this energy cleanse, she goes to talk to the life coach, who ends up getting Bonnie to open up. An emotionally open Bonnie is hilarious, as she gets irritated with herself for interrupting Christy. Meanwhile, Christy finds out that she almost got into law school, and just needs her test scores to be a little bit better. At the end of the episode, however, not everything is all great, as Christy and Bonnie find out that Jill relapsed, thinking she could drink a little bit of alcohol. There were many enjoyable moments in this episode, and I really liked the ending, which took the difference in views between Marjorie and the life coach very seriously. I did find it a bit over-the-top though, and I wish they had delved into more. What did you think of "Charlotte Bronte and a Backhoe"? Leave your thoughts in the comments!